The Version 8.x. 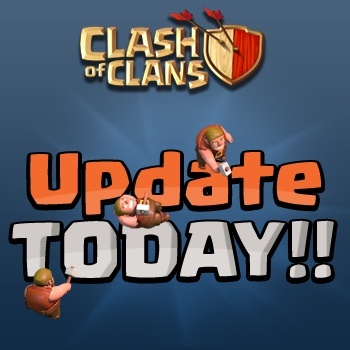 is one of the many Versions of the Clash of Clans game. AppStore (v8.67.7) and GooglePlay (v8.67.8). Town Hall 11 is bursting onto the scene! BOOM! Grand Warden & Eagle Artillery: The most powerful and strategic additions ever! Attack through Shield at any time, but be sure to protect your Town Hall! Goblins chasing Town Halls, bigger League Bonuses and Trophy offers, and so much more! Experience the biggest, baddest, most challenging Town Hall level ever: Town Hall 11! New Town Hall 11 hero Grand Warden can make armies nearly unstoppable! More defenses, including an extra Cannon, Archer Tower, Wizard Tower and X-Bow! New Town Hall 11 levels for Minion, Witch, Wizard Tower and more! The Grand Warden toughens all nearby troops and can make them temporarily invincible! Eagle Artillery only activates after many troops have been deployed, leaving the door open for tactical strikes and cunning multi-phase attacks! Town Hall destruction no longer grants a Shield – bring your Town Hall inside! Higher Leagues grant more free Guard – Titan I & Legend players get 100% coverage! Town Halls now hold lots of available loot – destroy them in battle for a big payout! Trophy offers get bigger and Trophy losses lower the higher your League!